Built in 1904 by the Canton Bridge Company of Ohio, the Wilson Pratt Truss Bridge is the oldest bridge in Dickinson County. With its pin-connected structure, timber deck and abutments, and concrete-filled sheet metal piers, this structure represents a common bridge solution applied to a relatively long span. By the early 20th century the range of choices for bridge designs and companies was vast. Many of the larger bridge companies, such as the Canton Bridge Company, sold metal truss bridges through mail order catalogues. County commissioners - who often carried the burden of selecting bridge locations - could simply specify the span and clearance needs and then choose the lowest bidder from the numerous competing companies. 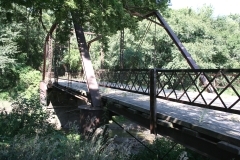 The structure is nominated as part of the "Metal Truss Bridges of Kansas" Multiple Property Submission as an example of a Pratt truss bridge and for its association with early 20th century transportation.